Dremel # 516 Abrasive Point bullet shape 1/2"
New genuine Dremel #454 Chain Saw Sharpening Stone A precision-ground abrasive made for extended usage. This reddish brown sharpening stone has a diameter of 3/16". Ideal for sharpening chain saw blades, quickly and easily. Dremel 541 Aluminum Oxide Grinding Wheel 7/8"
Dremel 8153 Aluminum Oxide Grinding Stone 3/16"
Dremel 8175 Aluminum Oxide Grinding Stone 3/8"
New genuine Dremel #8193 Aluminum Oxide Grinding Stone A high-quality industrial abrasive made for extended usage. 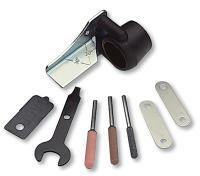 Ideal for sharpening, deburring and general purpose grinding on most materials including stainless steel. Specially designed for working with flat and slotted surfaces. Dremel 83142 Silicon Carbide Grinding Stone 9/32"
New genuine Dremel #83322 Silicon Carbide Grinding Stone A high-quality industrial abrasive made for extended usage. Ideal for sharpening, deburring and general purpose grinding on harder materials including stone, glass, ceramic, porcelain, gemstones and nonferrous metals. Specially designed for working with conic surfaces. Dremel 83702 Silicon Carbide Grinding Stone 1/8"
New genuine Dremel #84922 Silicon Carbide Grinding Stone A high-quality industrial abrasive made for extended usage. Ideal for sharpening, deburring and general purpose grinding on harder materials including stone, glass, ceramic, porcelain, gemstones and nonferrous metals. Specially designed for working with conic surfaces. New genuine Dremel #85422 Silicon Carbide Grinding Stone A high-quality industrial abrasive made for extended usage. Ideal for sharpening, deburring and general purpose grinding on harder materials including stone, glass, ceramic, porcelain, gemstones and nonferrous metals. Specially designed for working with flat and slotted surfaces. Dremel 85602 Silicon Carbide Grinding Stone 13/32"
Dremel 85622 Silicon Carbide Grinding stone 1/2"
New genuine Dremel #932 Aluminum Oxide Grinding Stone 3/8" A high-quality industrial abrasive made for extended usage. Ideal for sharpening, deburring and general purpose grinding on most materialsincluding stainless steel. Specially designed for working with flat and slotted surfaces. Dremel 941 Aluminum Oxide Grinding Stone 5/8"
New genuine Dremel #952 Aluminum Oxide Grinding Stone 3/8" A high-quality industrial abrasive made for extended usage. Ideal for sharpening, deburring and general purpose grinding on most materialsincluding stainless steel. Specially designed for working with curved surfaces. New genuine Dremel #953 Aluminum Oxide Grinding Stone A high-quality industrial abrasive made for extended usage. Ideal for sharpening, deburring and general purpose grinding on most materials including stainless steel. Specially designed for working with conic surfaces. Dremel 971 Aluminum Oxide Grinding Stone 5/8"
Dremel 997 Aluminum Oxide Grinding Stone 1/8"